I tend to be attracted to books that showcase timely social issues in a readable, narrative format. This is just such a book. 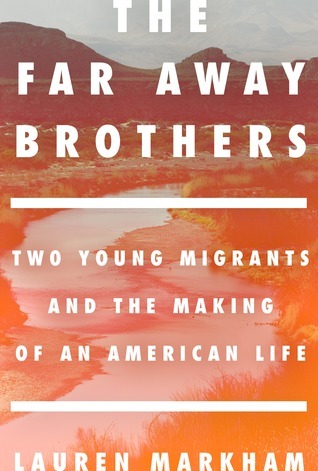 This is the true story of Ernesto and Raul Flores, identical twins who left their home in El Salvador in 2013 and illegally came to America without their parents at the age of 17. In their small rural town, the twins live with seven other siblings and their parents in crippling poverty and in constant fear of violent criminal gangs, which rule the countries of the Northern Triangle (El Salvador, Guatemala, and Honduras) with a iron fist. For $7000 each, Ernesto and Raul’s parents seek out a loan shark to pay for the services of a coyote, a smuggler who moves people through Central America and Mexico and finally through the desolate desert interior of the U.S. The story goes into detail of their capture in the desert by border patrol, detainment in a facility for unaccompanied minors (mostly from Central America), and their reunion with an older brother who also came north in the same fashion several years before. The story, however, doesn’t stop there. Markham follows her subjects through the myriad of challenges that make up the twins’ new American life: entering school, finding legal representation to fight deportation, learning English, paying down their accumulating $19,000 coyote debt, the struggle to send money home, family problems, and of course, the struggles that simply come with being teenagers. Interspersed throughout the book are snippets of ‘boots on the ground’ research done by the author of the various aspects of the Central American immigrant experience–their journey, frequent capture, detainment, and (almost always) deportation. I really loved this story because it was told in an easy to follow narrative style that completely humanizes the “illegal aliens” that the current president would love to build a wall to keep out. You learn about the high, very human cost of these efforts and how, despite what laws or wall is erected, many are still willing to risk it all to live the American dream, even if it means death. Loved this book. Get it right away!